Suggested Emphasis: God is in control of nations and of our lives. Jeremiah continued to preach and prophesy the word of the Lord as he watched the Kings of Judah lead the kingdom to its downfall. God sent Jeremiah to watch a potter at work. In watching the potter mould the clay, Jeremiah learned that Judah was in the hands of God just as the clay was in the hands of the potter. Later, The Lord told Jeremiah to destroy one of the potter’s clay jars by smashing it in front of the leaders of Judah. This showed how that the Kingdom of Judah would be destroyed if the people did not turn to God. You might notice as you are reading that God’s people are again referred to as “Israel”. This is the original name that had been used for all of His people before the nation divided into two calling themselves Israel and Judah. The half of the divided kingdom that had taken the name “Israel” no longer exists at this time. Only Judah remains but it is now often called Israel. Background Information on the Divided Kingdom. The political situation in Judah’s capitol city of Jerusalem had changed since Josiah’s time. Josiah was killed in a battle with the king of Egypt. Jehoahaz, Josiah’s son, was appointed king but only served three months. The king of Egypt dethroned him and placed another Jew on the throne. The Egyptian king changed the new king’s name to “Jehoiakim” and then, as insurance that the new king would rule to Egypt’s advantage, took Jehoiakim’s brother back to Egypt as a captive. Judah was on a downward spiral but God continued to send prophets to give the people a chance to repent. One of these prophets was Jeremiah. Jeremiah began his work as a prophet halfway into Josiah’s reign (640-609 B.C.) and continued through the destruction of Judah (586 B.C.). The Lord commanded him not to marry and raise children because future events- the fall of Judah- would wipe out the next generation (Jeremiah 16:1-4). Jeremiah was not just telling the people what he thought. He had a message straight from God. God could have given the prophet a message anywhere He wanted to. This time He wanted to use a visual aid that was in the potter’s house, so He told Jeremiah to go there for his lesson. A potter’s wheel is like a round table about two feet across. Instead of having legs at the edge, it was shaped more like a spool with a wheel at the top (the table top) and a wheel at the bottom. The potter used his feet to turn the wheel at the bottom making the tabletop spin. The potter would put a lump of soft clay on the table and shape the clay while the table was spinning. The potter was making a bowl or vase; but something went wrong, and it was ruined. We are not told what went wrong, but suppose there was a little twig in the clay, or a pebble, or a bit of clay that was dried and hard. Striking the potter’s hand as the wheel turned, it may have made a deep scratch around the vessel or even have broken off the whole top of it. Then the potter had to take out the lump or pebble or twig and start over again. Judah was all that was left of God’s Kingdom of Israel now; and God was in charge of Judah, just as the potter was in charge of the clay. Sin was like a lump or pebble that spoiled nation God wanted Judah to be. If the people would get rid of their sin, God would shape them into a strong and beautiful nation; if they would not, God would crush the nation and start over again. God’s promises and warnings are conditioned on man’s actions. God, who himself does not change (Numbers 23:19; Malachi 3:6; James 1:17) nevertheless will change his pre-announced response to man, depending on what man does. God wanted Jeremiah to tell the people to change their evil ways. The people rejected the message, however. Later they would receive the punishment God had prepared. Once again God had a message for Jeremiah (Jeremiah 19). He told Jeremiah to buy a clay pot from the potters shop. The pot in chapter 18 was pliable and could be changed. This pot was dried and hard and set. It represented Israel when it passed the point of no return. This was Israel when it refused to turn back to God. Jeremiah was to smash the jar and preach that it represented God’s people. God will smash the nation of Judah just as the jar was smashed (Jeremiah 19:10-11). Jeremiah was a prophet of God. God would give messages to Jeremiah and Jeremiah would preach the message to the people. Sometimes the people did not like the messages that Jeremiah preached. He sometimes told them that they were sinful. He warned them that God would destroy their country if they did not stop sinning. One time God gave Jeremiah a message in a special way. He told Jeremiah to go to the house of a potter. A potter was someone who made pottery. They used clay to make bowls, lamps, plates and lots of other kinds of dishes. The potter would take some soft clay and place it on a small round table. The potter would use his feet to make the table spin around and around. He would use his hands to squeeze and shape the clay until it was exactly like he liked it. Then he would put it in a very hot oven called a kiln and bake it until it was hard. After the clay was baked and hard, the potter could not change its shape. But when the clay was still soft, the potter could change its shape as much as he wanted. Jeremiah watched the potter work. 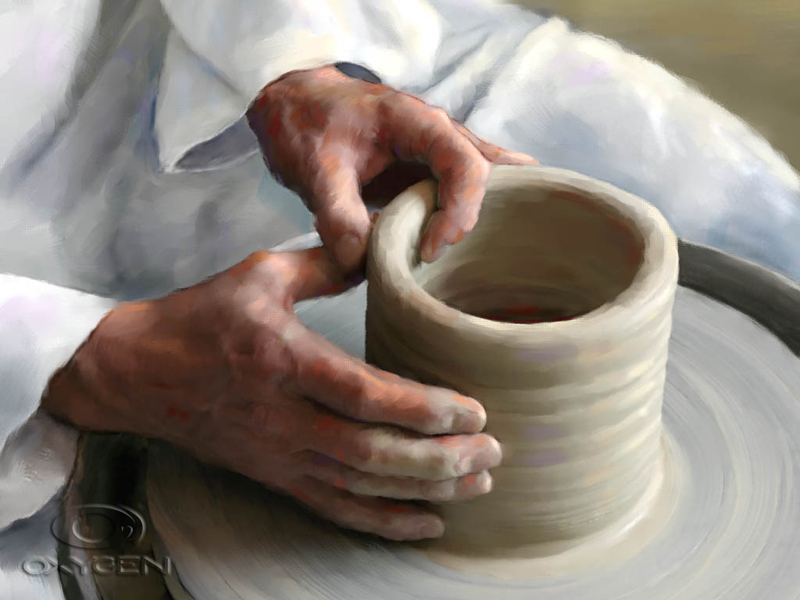 The potter spun the wheel and put his hands on the clay. Soon the clay began to take shape and look like a dish. As Jeremiah watched, something happened to the clay. Maybe there was a stone in the clay or some straw. Something was making the potter unhappy. The potter finally gave up and decided to throw the clay away and start over with some more clay. God told Jeremiah that his message was like the potter’s shop. God was like the potter and the people of Judah were like the clay. God wanted to shape his people and make them into a beautiful nation. Instead, the people kept sinning. Their sin was like a stone or straw in the clay. It stopped God from making Judah into something beautiful. God told Jeremiah to tell the people that if they did not stop sinning, then he would just throw them out and let them be destroyed like the potter did to the dirty clay. Another time God told Jeremiah to go to the potter’s shop and buy a clay jar. He told Jeremiah to take the jar and preach to the people. After he preached he should smash the jar. God’s message was to tell the people that if they obeyed him then he would protect them. If they did not obey him then their country would be destroyed like the jar. Some people think that prime ministers, kings or presidents are in control of countries. But really, God is in control of every country in the world. What lesson did the people learn when Jeremiah smashed a clay jar? God would destroy them if they did not obey. Ask a potter to demonstrate their work. Find out the names of political leaders of our city or country and have the class pray for them. Discuss the fact that God rules each nation. Send a card to government officials in your area thanking them for their hard work and telling them that your class prayed for them.